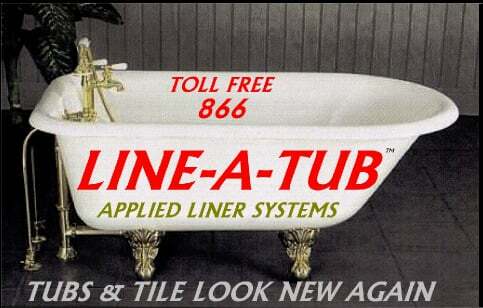 Line A Tub in Bloomfield, NJ has answers to frequently asked questions. Line A Tub has provided the following frequently asked questions for your reference. If you still have any questions, please give us a call at 1-866-LINEATUB. How long does it take to reglaze a tub? Processing time approximately three hours, provided the tub has not been refinished before. If the tub has been previously refinished, it takes longer due to the removal of old materials used. What type of material are used? We use an acrylic urethane. These materials have been proven to be very durable, strong and have a long gloss retention. What are your available colors? Our standard stocked colors are White, Almond, Biscuit, and Bone. Custom colors are available upon request with an additional cost. We offer a 10 year warranty for residential use and a 1 to 5 year warranty for commercial/rental use, provided you adhere to our care and maintenance instructions. These instructions are given to each customer upon completion of each job. Caulking if necessary is removed from around the tub. We then cleanwith an industrial cleaner, fill any minor chips then sand the tub. Oncefully prepared the tub it is primed with our bonding agent and sprayedwith up to five coats of our top coat. Also included is our non-slipsurface to the bottom of every tub at no additional cost. When can I use the Tub? Your tub will be available for use in 24 hours. Feel free to call us if you need answers to additional questions.